THE WINE Brunello di Montalcino 'Poggio al Granchio' by Val di Suga is made iin a magical place: a narrow valley on the south-east ridge of Montalcino. Historic cru for Brunello di Montalcino. Pure Sangiovese grapes, first refining in barrels then in French oak vats for a total period of 30 months. 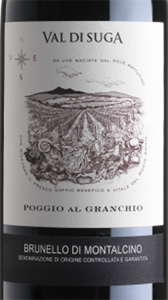 Elegant but decisive Brunello, with great potential for aging THE WINEYARD Poggio al Granchio is a magical place for its environment and landscape; it is a narrow valley on the southeastern side of Montalcino that descends down to Sant’Antimo . It is the area with the highest altitude vineyards on the Montalcino hill. It is a vineyard that gets the morning sun and is subjected to the strong climatic influence of Mount Amiata (former volcano and sacred Etruscan mountain) which looms opposite. This area of Montalcino has rich galestro soils, which are particularly good for Brunello . On galestro, Sangiovese becomes mineral and sapid, with silky tannins; on the nose it has notes of ripe fruits of the undergrowth, combined with that unmistakable hint of flint that you can smell directly on the schist. On the palate the wines make a subtle, elegant but assertive entry, turning out to be sapid and mineral. Here Brunello is a dark colour and has a great ageing potential. The name “Poggio al Granchio” comes from the small pond at the centre of the estate, under an imposing holm oak, home to some lively freshwater crabs. THE COMPANY A company with a unique feature within the terroir of Montalcino, Val di Suga differs from the other local companies for its famous three vineyards located in the three exhibitions of Montalcino. Three vineyards in essence, marked by deeply different characteristics: Vigna del Lago is exposed to the north, Vigna Spuntali is located to the southwest and Poggio al Granchio is located south-east. A difference therefore unique that of the company belonging to the Bertani Domains group compared to the others operating in Montalcino, that of being able to count on completely different vineyards from them and can therefore produce three types of Brunello that are equally different. The winery, located north-east of the municipality of Montalcino, is part of the original complex now renovated and reorganized with a new underground barrique and has a total area of ​​120 hectares, of which 55 are planted and cultivated in Sangiovese. 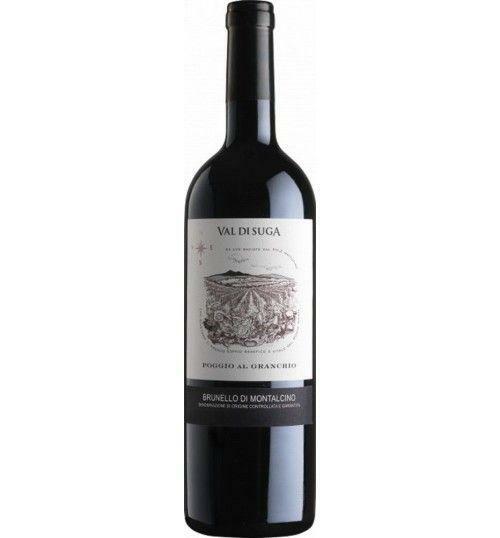 Val di Suga's added value lies in the diversification of being able to offer three variations of Brunello which are the perfect representation of three great crus, where the evolutions of Sangiovese are expressed in the totality of wines that are real cult of wine Montalcino. Before 55,00 € tax incl. Tasting Color: intense ruby red with violet notes. Bouquet: real explosion of fresh fruit with flavors of cherry under spirto, currant, blackberry and myrtle. Taste: thin with silky tannins, very long, sapid fi nal and mineral. Poggio al Granchio is a magical place for its environment and landscape; it is a narrow valley on the southeastern side of Montalcino that descends down to Sant’Antimo. It is the area with the highest altitude vineyards on the Montalcino hill. It is a vineyard that gets the morning sun and is subjected to the strong climatic influence of Mount Amiata (former volcano and sacred Etruscan mountain) which looms opposite. This area of Montalcino has rich galestro soils, which are particularly good for Brunello. On galestro, Sangiovese becomes mineral and sapid, with silky tannins; on the nose it has notes of ripe fruits of the undergrowth, combined with that unmistakable hint of flint that you can smell directly on the schist. On the palate the wines make a subtle, elegant but assertive entry, turning out to be sapid and mineral. Here Brunello is a dark colour and has a great ageing potential. The name “Poggio al Granchio” comes from the small pond at the centre of the estate, under an imposing holm oak, home to some lively freshwater crabs.